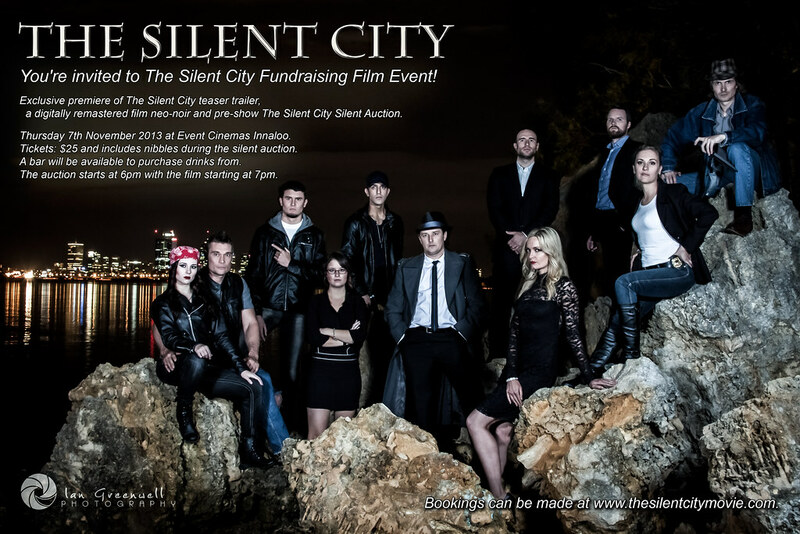 On April the 19th, 2014, a number of cast members will be presenting a number of sneak peak clips of The Silent City as well as answering questions about the movie. This presentation is thanks to Swancon 39 - Conjuration who have welcomed us to their series of panels. Details about the session can be found on the Swancon Programme and the panel will consist of Anthony Ciccotosto, Sarah Harris, David Partridge, Andreas Piechulik, Marcelle Weber and myself. This will be a rare opportunity to talk with cast on the cusp of the film itself being released, and find out a bit more about it. In other new, this weekend I will be filming the promotional video for my next project, Good With Words. I am very much looking forward to working with a new bunch of talented people. As long as everything goes well, we will be filming in the new financial year. Please ignore the unfortunate inclusion of bad punctuation. I suffer from an affliction which affects my ability to proof-read called Slacusbarstiniuos (say it out loud). This weekend is a big weekend. An audition for a possible Feature Film. Can't say much other than... Here we go! It is a new year. It feels like an important year. Last year things were changing. It felt like a lot of corners were being turned but hadn't been completely left behind. It was a transition year, and now it is time to see the fruits of it all. There are some exciting things happening in the local film and theatre scene of my home town of Perth, Australia. Last year saw the rusty old engine start revving on a dawdling film industry, and the outlook is for some rapid acceleration in 2014. Someone has loaded the system with WD40. There is growing international attention being cast our way. Big budget films are being made left right and centre. The Film and Theatre community have never been stronger. And I am not the only one feeling. It is a sentiment I am hearing from a lot of people. They all feel it. There is such a positive vibe in the air it is almost electric. I have been doing theatre and following the film scene for many years and I have never before seen anything like this. I have started a new blog (hamreflections.wordpress.com) which may interest someone, and having been a person who struggled to keep a regular blog, I have found this one surprisingly easy. I've even been inspired to reignite my Photography Blog also (jeffwatkinsphotography.wordpress.com) so pop over there if you are interested. Already, there are several projects in progress which is presenting some interesting opportunities for me, and a few more that have suggested a possible involvement, and we haven't even gotten through half of this month. To say I am excited is an understatement. We met with a number of challenging factors. Firstly, the temperature dropped during the evening to just above freezing. This is not all that common in Perth, but this winter (and indeed the last summer) has been a little more extreme than usual. So between takes, the cast were often seen hopping in and out of dressing gowns, quilts, jackets and the slightly warmer office space inside. Then there were environmental factors including passing trains along the railway some miles away. Large freight trains can take a long time to pass by and are very noisy. More significantly was the persistent alarm that repeated a cycle for hours on end. All attempts to contact the owner, security or anyone failed to resolve the matter. With these difficulties, what should have been a few hours of shooting slowly crept out to several more hours and colder temperatures. One fellow cast member was not wearing very much, ie thin clothing, and really soldiered through the night, and then cut down by the dreaded flu. Now I have a short break of a few weeks before I have four weeks of weekend filming, which will wrap up my character for the show. For the very first time we will be releasing an exclusive premiere of The Silent City teaser trailer. The Silent City is a spectacle of murder, mystery and intrigue. Set in a city very similar to our own, The Silent City will keep you on the edge of your seat from the opening sequence right through to the closing credits. Do not miss out on the first glimpse of what is set to be the jewel in the crown of the Perth film industry. The night begins with a Silent Auction with many items generously donated by our sponsors. Mingle with the cast and crew, a drink in hand, and place a few bids on the items that you most desire. Afterwards, make your way into the cinema to watch the first and only public viewing of The Silent City full length teaser trailer. After the trailer, relax and enjoy a magnificent film Noir on the big screen. UPDATE: It has been confirmed that our feature film of the night will be Chinatown. Starring Jack Nicholson and Faye Dunaway, and directed by Roman Polanski. Ticket includes the showing of a film noir, exclusive 10 minute sneak peek preview of The Silent City (not shown anywhere else), pre-show The Silent City silent auction and nibbles. A bar will be available to purchase drinks from. Thank you for supporting The Silent City.